It has been incredibly busy in the shop this winter, so much so that I haven’t had the wherewithal to take any before/after photos of the books! I continue to be amazed by the books that come my way, humbled by the stories my clients bring with them, how these dusty broken objects can hold so much meaning. It’s particularly poignant to be working in this trade in this city, in the midst of all the change that new technology is ushering in. I have no projections about the destiny of the Book but it seems true that most of my clients go out of their way to find a book restorer to fix the physical structure of a book that they can read for free online instantly. Books are still just a very likeable form for some of us. 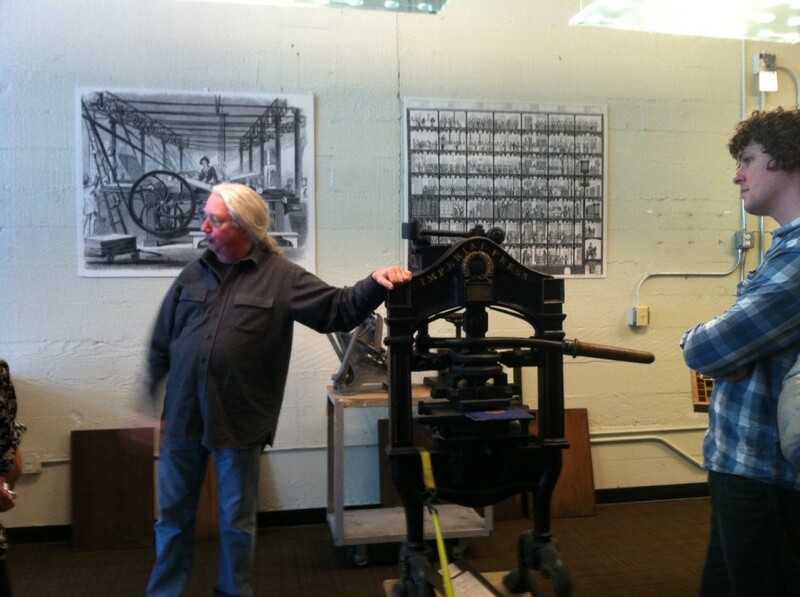 I recently visited the American Bookbinders Museum here in SOMA for a tour. It traced the history of bookbinding in the US from hand bookbinding to the industrial production lines of the 19th century factory binderies. I was intrigued by all the ways in which mechanization was able to substitute for the labor of the hand. There’s a cast iron machine that only rounds the spine of a book, for example. These innovations in production were what allowed for books to become middle class objects in the 19th century, and that was a good thing, and yet it made me wonder about the quality of life/labor of the machine operator versus the hand bookbinder. It is certainly strange to be aware of and to participate in our own evolution! Happy New Year!